Each year, the Kenyan fashion industry seems to go a notch higher in building itself into a serious sector. In 2012, it had more good moments than bad ones. New faces have come into the scene, for example Jamil Walji and Katungulu Mwendwa, while some of the established fashion names reaffirmed their presence. In March, KikoRomeo, one of the oldest local fashion houses, re-launched its menswear with the Kenya Rugby Team’s help. The team members modeled the fashion house’s latest African shirts and bespoke suits based on a James Bond theme. According to Ann McCreath, the founder and head designer at KikoRomeo, the elaborate re-launch was to send a message to the local market that menswear was still at the core of fashion house’s business, despite the prominence of ladies wear. That was but just one of the many events that happened in the year, which has been good for designers who not only showcased their work but also sold them. A good example is Tribal Chic, a fashion event organized by Tribe Hotel. In May, Tribal Chic partnered with GenArt to give the fashion and arts industry an international exposure, especially in the US. GenArt is a US-based global arts and entertainment company, which scouts and showcases talent in film, fashion, music and visual arts. For fashion, it holds an annual Fresh Faces programme that gives budding designers a platform to showcase their work. This year, newcomer Katungulu Mwendwa was the first Kenyan designer to display her Tuareg inspired collection at the New York Fashion Week in September. In April, Italian Vogue editor-at-large Franca Sozzani visited Botswana, Mozambique, Ghana, Nigeria, Kenya and Ethiopia for the “Africa Issue”. The Wall Street Journal describes Ms Sozzani as “a fashion activist, using the powerful Vogue name as a platform to comment on — and try to change — society.” Her visit put Kenya’s fashion industry on the global stage, especially for Patricia Mbela, John Kaveke and KikoRomeo who were featured in the magazine’s May issue. Festival for African Fashion and Arts (Fafa) made a comeback last month. During the one-year break it went back to the drawing board to expand beyond celebrating peace and help fashion designers build their businesses. Apart from celebrating African fashion it also organized a competition for designers dubbed Fafa Insight, which Walji won to take part in its gala night back in July. 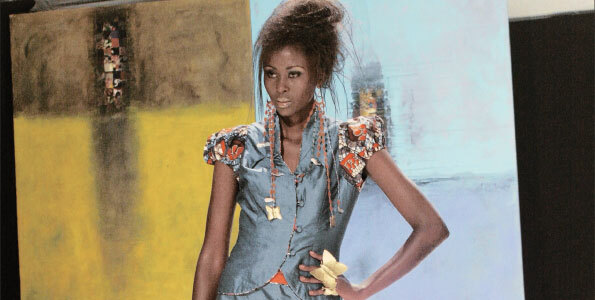 Trendz Kenya Fashion Festival, in its third year, was bigger and better. Organized by Sonu Sharma, a fashion designer, it attracted participants from India, South Africa and Tanzania. However, the African Fashion Fair (organized by Lucy Rao of Rialto Fashions) did not take place. The event that made the biggest splash in the industry was Swahili Fashion Week in October. The event began in Tanzania in 2008. Mustafa Hassanali, the founder, says the Nairobi edition is set to grow a strong following and shape the fashion industry in East and Central Africa. It was big night for Mbela, a well-known designer in the local fashion circles and the 2011 Designer-of-the-Year at the Swahili Fashion Week. Her collection of Music of Many Colours was fun, bright, alive and truly Afro-centric. She did not paint her outfits but instead used beads as back bodices or part of an outfit – a wide belt of beads between the bodice and skirt. Her signature intricate jewellery as adornments did not miss either. The surprise came from Moo Cow, known for linen or monochromic minimalist designs, who showcased kanga collection decorated with brass and aluminum jewellery from Embody Accessories. Away from the runway, Jamhuri Wear from New York with its new base in Kenya launched the Buyu Collection. Thanks to the Internet buzz, the luggage collection which includes a weekend bag and pouch became a covert item in fashion circles. Made from the baobab tree fibre and leather, Jamhuri Wear made a statement that traditional materials can be used to make luxurious items that the world can appreciate. With fashion blogging growing every day, some of the bloggers no longer just comment on fashion events and trends but also actively participate in events to promote the industry. Franklin Saiyalel (Kenyan Stylista) and the online retail website Closet49 collaborated with social enterprise – Africa Fashion Guide to host the first Fashion Africa 2012, a conference to share ideas and information. It also sought to create awareness and “elevate the perception of fashion design from the continent”. The industry has not been without hurdles though, in the 2012/13 National Budget the duty on imported second-hand clothes (mitumba) was reduced from Sh1.9 million to Sh1.1 million on a 20-foot container. The government said the move would help tackle unemployment, especially among the youth. However, fashion designers felt that this could hurt the growth of fashion industry because it directly affects the key material for their work; fabric. There is a sense of excitement for what the next year will hold, will fashion shows yield more sales for designers? Will there be bold and dramatic designs on the runway? Will it bring new names to watch? Will there be a new “it” fabric like the Kanga, Maasai blanket and Kitenge? If 2012 is anything to go by, the fashion industry is likely to surprise us even more next year.